Avid recommends installing the 1.1 Update for all users of the 1.0 version of Avid Studio. Once installed, the Avid Studio 1.1 Update cannot be uninstalled separately, but only with a complete uninstall of the full Avid Studio installation. Does anyone know what’s causing this and what I can do to fix it? Adding a Picture-In-Picture (PIP) effect is a little different in Avid Studio than in previous Pinnacle Studio versions. 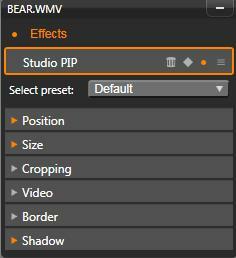 The PIP effect is found in the Effects Editor. To access it either double-click on the clip that you want to apply the effect to or right-click on the clip and select “Open Effect Editor”. Note: Remember Avid Studio uses a top-down overlay priority system. So track 1 overlays track 2, etc. Make sure to add the PIP effect to the track that you want on top. Once in the Effects Editor select 2D-3D. Then select Studio PIP, or if you want a PIP window with a different shape you can select MultiShape PIP. As with other Effects the Picture-In-Picture effect is keyframable to allow for maximum utility. For more information regarding AVID Studio, read the information below. All this content is summarised on the website: All about AVID Studio. There is a bug in Avid Studio software that enables the Red Giants plugins does not show if the program is installed on the Danish, Norwegian, Swedish or Finnish. At present there is no solution other than to install the program in English. For those who subscribe to our free newsletter, you found out exclusively on 09/09/09 in our article "Pinnacle Studio 14 HD, Ultimate and Ultimate Collection". Some questions have already arrived through the comment section. Of course, with every new version (and not only with Pinnacle products), we have people who are happy, those who are less satisfied, and many who are in between. That's what gives vitality to our website; we are open to all comments, as long as they stay objective. Before going further, let's have a look AVID press release. So, I installed the DVD Studio 14: it was fast, very few warnings ... In short, I was a happy user. You won't be asked to uninstall any previous version. 3 minutes for upgrading "Windows Installer" (V4.5). Note, you will need to re-boot your computer. 16 minutes for upgradig Studio 12 to Studio 14 Ultimate Collection. The system re-installed my video driver and the installer asked me to localize the "MarvinBus.sys" file (nothing very serious, I just gave it the current location, Windows\System32, but don't worry, we will post a tutorial later on for upgrading). On my side, I had just a small problem when registering, probably due to the fact that I quit in advance and the server wasn't prepared to see a Studio 14 user ? We will do a quick overview of the general design, without going into details. page concept in various windows have been replaced by a scroll bar. This is a big thumbs up in my opinion ! the two volume units (stereo view) which help you to visualize the sound level. Welcome screen which gives you access to a small tour that everybody should follow ! Very well done. You also have the ability to load the test project to have an overview of Studio 14 capabilities. Finally, the free video training link is the same one that the one we propose in our Pinnacle Studio webpage, right column called "Quick Links - Pinnacle Resources"
Motion titler interface, seems quite difficult to use, but we will come back to this topic later on. Also a big disappointment for those of you who are wanting more video tracks... Pinnacle Montage can be a temporary alternative ? And what about plugins ? And Studio 9/10/11/12 content ? other plugins like proDAD VitaScene, Heroglyph, Mercalli, Adorage: use the Content Transfer Wizard (insert Studio 10 DVD Bonus and ask for a repair) AND afterwards, apply the various patches that you find on our download page, proDAD VitaScene, Heroglyph, Mercalli and Adorage section . So now, you should obtain the whole Studio 12 content, without losing anything except SmartSound. For your information, I recorded the full install process, so I will be able to upload a tutorial pretty soon. This way, you won't have any problem to update, and you will be assisted in doing so, as usual with our website ! On my configuration, I have the same problem as the one I reported when closing Pinnacle Studio: studio.exe process is still alive, and I need to manually kill it (using task manager). That's not a big problem, I think it's only in certain cases, I never read similar problems on the forums. Otherwise, I also have Pinnacle Studio 9 and Pinnacle Studio 12 installed. They all live together !! I can also open Studio 9 while using Studio 12 or Studio 14. But I can not open Studio 12 and Studio 14 both together. Probably due to the engine which is similar. But for sure, that's not a big problem, except if you want to do side by side comparisons! This interface has been slightly redesigned. Studio lets you incorporate many kinds of media in your video productions. When these are stored externally from your computer – on a camcorder tape or a memory stick from your digital camera – they must be transferred to local storage before you can use them. You can also capture your webcam activity, live ! Various controls depend on the task you are performing (DVD importation, ...). In this window, you will also use the famous "Stop Motion" mode, or the snapshot feature. We will detail these new functions later on. That's rather simple: whereas the Album is a central library of available resources, the Bin contains only those items that either already belong to the current project or that you have specifically earmarked for possible inclusion. Pretty cool !! We will see in the future if we use it, or if we stick with old habits. In my opinion, this is the most interesting part of this new version. Studio’s Motion Titler is a powerful tool for creating and editing animated titles and graphics without using plugins or HFX effects. As such, you will be able to animate text without using anything else than this new titler. But I have to admit that it is not so easy to use, not so intuitive... You will find the usual titling categories (ressources, objects, looks and motion or "effect"), as well as a timeline on which you will add layer and effect, customizing the effect on the timeline. Motions contains the animation routines that give the motion titler its power. They are divided into three classes based on the portion of the layer's lifespan they affect: Enter, Emphasis and Exit. In each three classes, several standard types based on their mode of action: letter-based, word, line or page-based. On my side, I had some difficulities editing the existing motion, to better understand how they are constructed and to better understand the working condition. I hope that we will later on have additional information. Concerning Red Giant plugins, you apply it as any other plugin; access to the settings is standard, you set it with the usual window. No specific interface. Some presets already exist, and then you can do whatever you want, by modifying certain parameters. Try it, and give us your best settings ! And for those who read this article completely, you will probably be more than happy to know that you can already order the Pinnacle Studio 14 upgrade by itself, with a $20 discount, following this link: Pre-order Pinnacle Studio 14 upgrade (I say again, it concerns only upgrade version). Which Studio 14 version should I choose ? The Photo Browser can be found her server and client example. Stream video live from your mobile to the web at Bambuser. For at lave Pan og Zomm skal man først vælge Videoeffekter, der efter Standard RTFX og effekt "Pan Og Zoom". Klik ok for at tilføje den til Videoeffekter listen. Nu kan man s vælge et omgåde af filmen som man ønsker at zoome i. Jeg valgte 3 punkter hvor jeg så ændrede pan og zoom mellem punkterne. Hver gang man vælger et sted og ændre i Zoom tilføjes et punkt. Derefter er det bare at trykke play og se om det var det man ønskede. OBS Hele det stykke af fim som man har udvalgt skal nu renderes.